Microsoft is using the term Advanced Threat Protection with several products so it can be difficult to find the information you need. In this article we are referring to Office 365 Advanced Threat Protection which is unrelated to Windows Defender Advanced Threat Protection. Anti-Phishing opens all links in a Microsoft cloud virtual machine to see if it is asking for credentials AND if that page is legitimate or not. If the message appears legitimate the email is delivered to a users inbox. If not it can be flagged, quarantined or deleted. Safe Attachments opens every attachment in a Microsoft cloud virtual machine and runs it against all common software. For instance, if the attachment was a Word .DOC file, Safe Attachments will open it in Word 2007, 2010, 2013, 2016 and 2019 to see if it contains a malicious payload. If the message appears legitimate the email is delivered to a users inbox. If not it can be flagged, quarantined or deleted. some tricky hackers may build a site with nothing malicious on it, then send the email, wait an hour or two for it to get through the Safe Links / Anti-Spam / Malware checks THEN change the site to have malicious content. If Microsoft were to only check links in the cloud before email was delivered to your inbox, this hacker would get through the filters. These three features cost USD$2/seat/month and for most companies is money well spent. At the the recent Microsoft Ignite conference in Florida I took an ATP hands-on lab and argued that Phishing is not only the biggest threat facing IT but the biggest threat facing nearly ALL companies. Staff stealing data, CFO’s stealing money, not being able to find qualified staff for critical positions and even threats of war in some regions pales in comparison to the threat Phishing poses. All of the other things are either limited in scope or MIGHT occur in the future. Phishing can bankrupt a company (through the actual theft AND loss of reputation) and it is constantly occurring at an increasing pace and quality inside of every organization including yours. 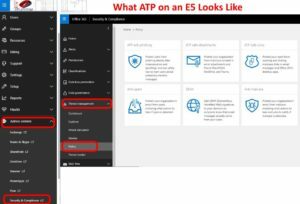 I believe that ATP should be part of the Exchange Online Protection module and made available at no ADDITIONAL cost to ALL Office 365 customers. If the price needs to rise to cover the cost, so be it. The damage occurring to Microsoft’s reputation because they know about these hacks but let them through anyway is increasing daily. One argument I heard against this is that it will delay email delivery and while that is true I suspect it will only delay it a few seconds at most and virtually no-one would notice.